When I started researching on the Hopi boarding school experience at Sherman Institute, I thought for sure that I would come across many references of Polingaysi Qoyawayma (Elizabeth Q. White) at the Sherman Indian Museum. She is, after all, one of the school’s most famous alums. I looked in the Sherman Bulletin, the school’s student-written newspaper. I examined various letterpress books and other school records, but I never came across her name. While conducting research at the National Archives in Laguna Niguel, California, I uncovered a file with a name similar to Polingaysi Qoyawayma written on the tab. I thought I found the documents that I had been searching for. But when I examined the records closely I discovered that the file belonged to someone else. In an attempt to find clues that would lead me to archival information on Qoyawayma, I reread Don Talayesva’s autobiography Sun Chief. Talayesva and Qoyawayma attended Sherman at the same time. They both came from Orayvi and likely traveled with each other to the school in November 1906. But nowhere in Talayesva’s book does he mention her name. Fortunately, one does need to depend on Talayesva or an archive to learn about Qoyawayma’s experience at the Indian school in Riverside. Although the archival record may appear to be silent, at least in reference to her time at Sherman, her story remains with her family, others who knew her, and in her book No Turning Back. The documents that I searched for may never surface. They may not even exist. But Qoyawayma has already shared with us about her school days at Sherman Institute. She has already provided us with the archive, the documents, and the narrative of her life. SATURDAY, MAY 22, 2010, 8:00-9:45 a.m. When I was younger I studied classical guitar with Tom Sheeley at Northern Arizona University. I had dreams of becoming a professional Spanish classical guitarist, but that aspiration never came to be. 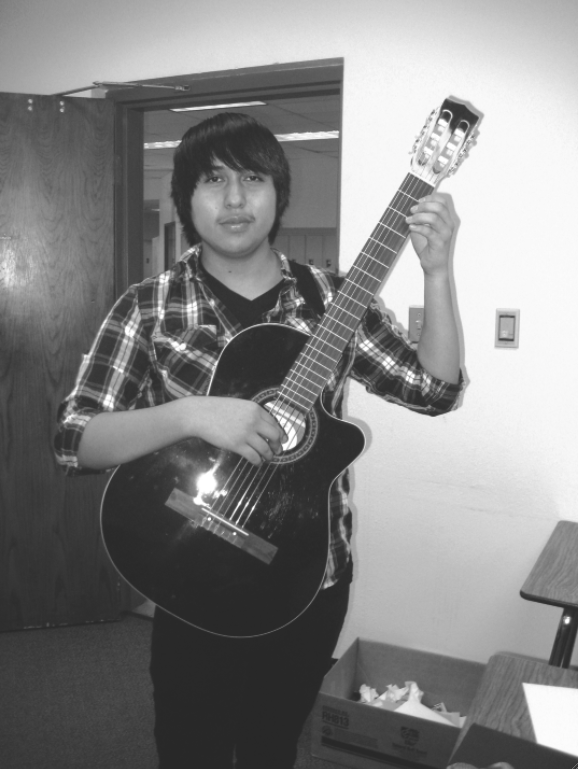 Below is an article about a sixteen year old Hopi guitarist named Malcolm Mowa from Kykotsmovi. One of his compositions titled “Aerial Ice” was recently aired on National Public Radio. I am looking forward to hearing more about this Hopi musician in the future. POLACCA, Ariz. – A Hopi High School music student has hit the national airwaves. Malcolm Mowa had his musical composition, “Aerial Ice,” performed on National Public Radio. He wrote the piece, which was performed by Ethel, a four-string quartet. Mowa, a 16-year old junior, said Ethel performed great and he was excited about having his piece aired nationally. He initially wrote the piece as part of the Grand Canyon Music Festival when artist in residence Raven Chacone came to Hopi High and taught six students how to compose. Mowa learned about his piece being aired nationally when it was announced over the school’s intercom. “It motivates me to want to do more with music,” he said. “I want to go to school for music composition and guitar.” He also wants to learn to play the piano. Mowa said his parents were excited and happy about his composition being aired nationally. “Everybody wants to hear it, but nobody knows when it was played,” he said. Thomas Irwin, band teacher at Hopi High, was equally ecstatic about Mowa’s piece getting national airtime. The new programming allows the top high school students from throughout the nation to have their pieces aired. One of Irwin’s former students at Monument Valley High School received a $10,000 endowment for his work. Irwin said he hopes Mowa stays serious about his musical work because he can major in guitar or composition, and scholarships are available to him. Irwin said Mowa’s fellow students were happy for him, although some teased him about his success. Mowa said “Aerial Ice” was a happy tune about how he felt at the time. It’s classical music and it’s just instrumental; there are no words. He added that he likes classical music better than hip hop or rap. “It’s better than a lot of the music that’s out there. It’s mellow, nice – not bad stuff,” he said. Mowa likes alternative rock, classic rock and pop music. Mowa is also part of the Hopi High guitar class, which recently performed at the Hopi Cultural Center and other places in the community. “It was weird because we were playing off to the side while people were eating, but people were happy we were playing. They would put down their food and listen,” he said. Mowa, who also plays baseball, maintains a B average and hopes to get a music scholarship to college. He is the son of Uberta and Clifton Mowa from Kykotsmovi. I recently returned from attending the American Indian Studies Association (AISA) Conference in Tempe, Arizona. I delivered a paper titled “Hopi Footraces and American Marathons, 1912-1930.” This paper, in its article form, will appear next month in American Quarterly. I was happy to see that some Hopis came to my talk, including two students from ASU. Since I first presented on this topic, I cannot recall the last time I had Hopi long distance runners in the audience. Both of these students were runners. After the session I talked at length with the students about how the world focuses so much attention on Louis Tewanima, but back home our people realize that while Tewanima was good, other Hopi runners were just as good or better than the famous Olympian from Shungopavi. Although these students already knew about Tewanima, they had not heard of the other runners that I mentioned in my paper. I also did not know about these runners before I started this project. One of the most rewarding aspects of being a faculty at the University of Illinois is the opportunity I have to make my research available and meaningful to the Hopi community. This has always been the driving force behind my work.